The shows were separated by a meal of homemade Irish stew, made by members of St. Paul the Hermit’s congregation, plus many more desserts. Pictured: Billy Brennan fills his plate, dressed in his St. Patrick’s Day best. Pembroke’s Jim Beattie rung in the St. Paddy’s Day fun early at the Sheenboro Hall on Sunday, where folks gathered to catch two of his Musical Tour shows. 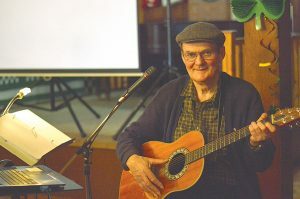 Beattie performed his Musical Tour of Ireland and Musical Tour of the Ottawa Valley for the crowd, singing and playing guitar to everyone’s delight. 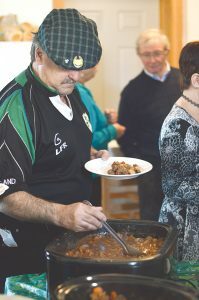 St. Patrick’s Day celebrations came early to Sheenboro, when the community gathered together for not only a meal, but a full trip of Ireland and back through the Ottawa Valley on Sunday evening. Packing three long tables at the Sheenboro Hall, Jim Beattie’s Musical Tours entertained for over two hours of music and storytelling, to the point that floorboards were trembling as some audience members stomped in time with the rhythm. The evening was split into two portions, with Beattie guiding his audience across the map and through authentic experiences. The first half of the evening, starting at 4 p.m., was dedicated to travelling around Ireland, while the latter was a tour through the Ottawa Valley.